The great thing about Austin is that on any given night you can find an exciting array of adventures at every turn. Each night holds the promise of something amazing if you know where to look. So in a city that prides itself on being unapologetically weird, why settle for an average happy hour or an average night for that matter. Instead, why not get the real Austin experience by immersing yourself in the whacky culture and one-of-a-kind nightlife of this anything goes city. From axes and ales to tequila and tarot, here are 10 totally unconventional – and totally awesome – happy hours in Austin. This kitschy casual diner offers tasty 24 hour eats and bomb breakfasts out of their walk up window 7 days a week. Irene’s is the kind of place you go when you’ve got a hankering for a stiff drink and some straight forward American grub. With menu items like Pigs in a Blanket, Loaded Mashed Potatoes and Hot Ham and Cheese sammies, you’ll feel like you just walked into an Archie comic, except better because there’s booze! Though this retro-chic restaurant has great happy hours daily, Irene’s hosts a special happy hour every Tuesday night that’s out of this world! Tequila and Tarot Tuesdays is a free event at Irene’s with bitchin Tequila specials all day that include $3 Tequila shots and $3 margaritas and free mystical tarot card readings by Kristen of Senders Receive. The first concept of its kind in Austin, Urban Axes is a great chance to get out a little aggression while you get a little buzz. This manly venue is perfect for birthday parties, unique corporate events or unusual first dates. But for the average happy hour seeker, you and your friends can book a session (recommended over walk-ins) and go full on Paul Bunyon while you toss back a few beers. There’s no alcohol or food served on premise, but guests are welcome to BYOB (or wine) and store it in their coolers while you work up a sweat wielding one of the world’s most ancient and primitive tools. You can even pack a picnic and camp out with some sandwiches and brewskies to help recharge for another round of one of the most unusual competitive sports around. Recently moved to a new spot on West 6th street, Kung Fu Saloon is a unique after hours concept in downtown Austin. Along with happening happy hours and a great rooftop space, this karate kick back also has a variety of classic arcade and table games like Pac-Man and Skee-Ball. Kung Fu Saloon is all about community and hosts regular get togethers throughout the week that include Pints and Pedals bike rides and Punch Out Boxing nights. But if you’re looking for a really fun – and intoxicating – way to give back, then join Kung Fu for their Drink for a Cause happy hour. Each of these benevolent beer bashes supports a different cause from breast cancer awareness and disaster relief to start up tech companies and college funds. Since opening in 2010, Kung Foo has donated over $250,000 to local charities from these happy hours! So stay thirsty Austin, because here, every drink counts! Located in east Austin, White Horse is a popular watering hole and dive bar with strong drinks and even stronger personality. This eclectic event space hosts a variety of rowdy floor stomping get togethers including Monday Night Swing and Honky Tonk Tuesdays. And in the true spirit of Texas, White Horse hosts a rootin tootin happy hour every Friday where you can grab yer partner and yer dancin boots and learn to two step for free courtesy of Dancin’ Austin. Because nothing’s funnier than a bunch of tipsy cowboys dancing like they’ve got a snake in their boots! 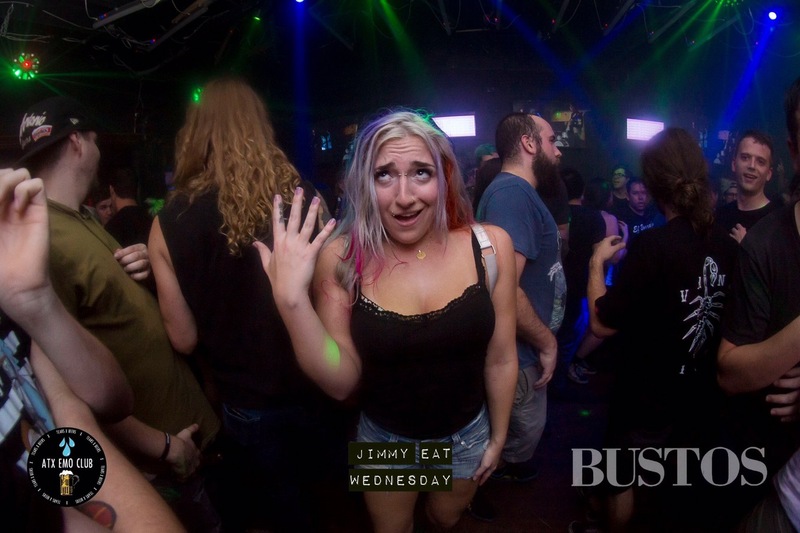 One of Austin’s most iconic downtown dives, Barbarella is a funky music venue and lounge that serves up swinging tunes and saucy drinks in a delightfully grungy setting. This bizarre bar hosts all kinds of intriguing events throughout the season that are bound to turn a few heads. There’s a Tuezgayz party every Tuesday night, Jumpin Jumpin 90/00s Nite once a month and music diva tributes left and right! But the happy hour that seems to draw the biggest crowd is Barbarella’s Jimmy Eat Wednesdays: a punk/grunge themed happy hour co-hosted by the TX Emo Club that takes place at the neighboring Swan Dive every Tuesday. So bust out the black nail polish and get ready to head slam to all your favorite local anti-establishment bands at this rockin hump day party. Perched off popular east sixth street, Hotel Vegas is a badass dive bar and event venue known for their off-the-wall parties and energetic crowd. This happy hour hub is packed with plenty of drinks and entertainment any night of the week, from trivia on Wednesdays to Thanks a Brunch on Saturdays. On top of an endless parade of live shows, parties and drink specials, Hotel Vegas also hosts a super fun pop up shop once a month featuring food, drinks, dancing and shopping under the night sky. Co-hosted by Eastside Pop Up, this free monthly get together is a great place to grab some grub, browse the booths and dance til you drop in downtown Austin! One of Austin’s most quirky nightlife haunts, Spider House Cafe and Ballroom is a popular theater/restaurant/bar in south Austin. This avant-guard event venue boasts a courtyard full of food trucks that include Cool Beans and Arlo’s, and 5 indoor/outdoor stages where you can find great live shows and crazy performances that celebrate the many magnificent oddballs and misfits of the city. From riotous open mic comedy nights to titilating peeps shows and burlesque performances, Spider House has it all! But for one of the most articlstic and entertaining performances in the city, check out Austin Poetry Slam night, which takes places every Tuesday at Spider House and features one of Austin’s premier poetry troupes. This uber creative happy hour will have you wearing barets, snapping your fingers in unison and sipping lattes in no time! Established in the heart of downtown, Guero’s Taco Bar is an iconic Austin hangout on South Congress that offers great drink specials, live music and of course, tacos! Oddly enough, most people don’t visit Guero’s for the food, but rather for the fun community events that Guero’s hosts in their quaint outdoor garden. Here you can find Saturday morning farmers markets, Sunday Brunch bands and hopping happy hours every other night of the week! And in true Austin style, Guero’s hosts a special happy hour once a month that showcases the freshest and hottest Indie rockers in the music capital of the world. Indie Music Mondays are all night jam sessions that feature live music performances and killer drink specials like $2 beers and $4 frozen margaritas. Each month brings a different local indie group to Guero’s outdoor stage, which means you’re always in for something different and great! So grab a gigantic SoCo-Rita, kick back under the ancient oak trees and enjoy the best of Austin’s local music scene. One of Austin’s newest and coolest communal lodges, Native Hostels offers guests a unique “glamping” style experience complete with luxury dorms and an onsite lounge. But you don’t have to necessarily book a room in order to enjoy the fabulous amenities and fun events that this trendy boutique hotel hosts. Lost of Austinites like to stop by the Native for some tasty craft cocktails and a couple hours of stylish lounging. Whether you’re looking for funky fitness sesssions or swinging dance sessions, the Native has a variety of community events that are open to anyone looking for a new experience in Austin. But one of the Native’s most talked about get togethers is their popular boozy yoga flow class, which takes place every week inside the Native’s airy Romper Room. At Yoga Flow guests can enjoy all day happy hour prices plus a relaxing yoga session taught by one of Austin’s talented yogis. You can even bring your beer right to your mat and take a few sips in between position changes – if you’re skilled enough that is. Located in up-and-coming east Austin, Full Circle Bar is a playful after hours hangout that brilliantly mixes booze and skeeball. This slightly sophomoric dive bar brings out the kid in everyone with a room full of classic arcade games, exciting tournaments and even an adult-sized ball pit that you can romp in. Full Circle Bar serves up stellar drink specials most nights of the week, but they are also home to some of the most outrageous tournaments and parties in Austin including Brewskeeball, CornholeClub Wednesdays and It’s a Roll Off: Blind Skeeball Event. If you’re looking for an out-of-the-box way to spice up your mid-week routine, visit Full Circle Bar Wednesday and Thursday nights for free skeeball sessions and tasty happy hour drinks. And just like a kid, after one game you’ll be hooked. So many fun things to do…so little time. Rio rita does a queer kareoke from 6-10. They just started doing it. Lizzy Carol hosts.